Regime Superman has been poisoned with Kryptonite. 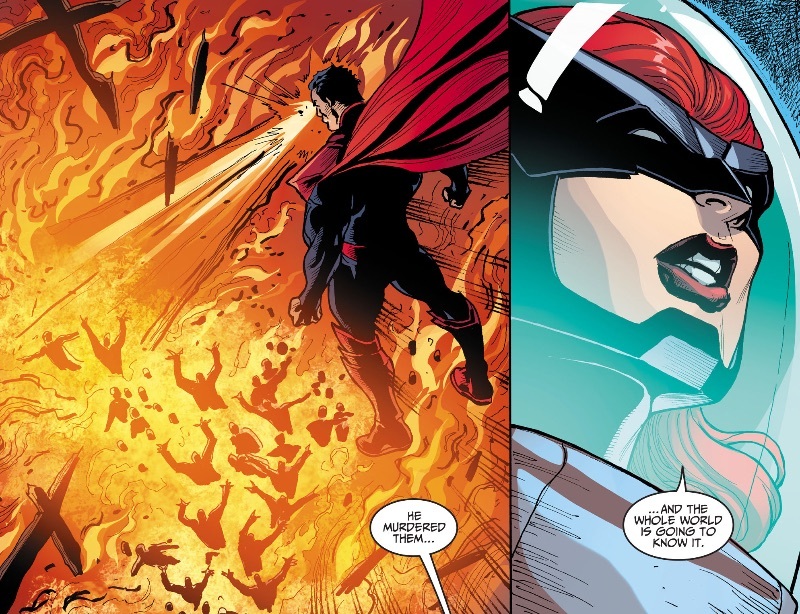 Cyborg has been abducted by the Insurgency, in an effort to obtain a smoking gun and expose Regime Superman's murderous ways. Story - 3: Cyborg's abduction presents an interesting idea, for the extreme meta-heads out there. Is Cyborg being violated, i.e., raped by Batman and company. The data that the Insurgency wants could be obtained by other, and more simpler means. 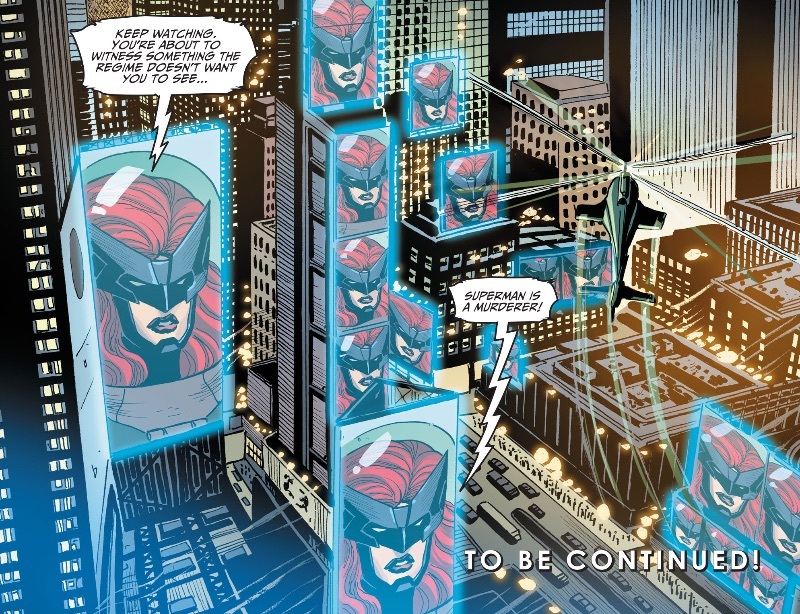 Batgirl's expertise with accessing data alone would be able to do so. Does the Insurgency have the right to abduct and perform and invasive procedure on an unconscious Cyborg, if only because he's a member of the Regime? The answer is obviously of course not, and it richly shows how low Batman has fallen, along with the rest of the Insurgency who accompany him on this endeavor. It smacks of Joker and Harley Quinn's abduction of Lois Lane, performing surgery on her to blow up Metropolis, etc. Regime Superman's killing of the fledging uprising against him is conveniently caught on film, with a full malarkey explanation to support it. Forget that it wouldn't be possible to capture Regime in this act, unless he was purposely being tracked, but it's all for naught. If you've played the video game, or have just followed the basic plots of Injustice, you know that Regime will get away with it, which defeats any potential build-up towards a climatic scene, but it's also just indolent. Readers have been treated to a lackluster year and Buccellato intends to keep it that way. Art - 3: I live in NYC. I've been to Times Square several times. It's easily researched, Googled, etc. While I usually rave about Derenick's work, pages like this match the equally lazy hand that Buccellato has been laying to the book since Year Three. Cover Art - 4: Heavy is the head that wears the crown, and Regime wears that all over. Really nice.